Not only are strawberries the "World's Happiest Fruit", but the many interesting facts about strawberries make them one of the world's most fascinating fruits, too! But many people aren't acquainted with even the basic tale of this bright red star of the garden. Maybe you aren't, either? Don't worry! Here you will find everything you need, important and trivial, to be "in the know" and become an educated strawberry lover! The strawberry facts begin with a Strawberry FAQ. These pages cover the most asked strawberry fact questions on the Internet. It is also good to know the strawberry parts, that is, the parts of a strawberry and a strawberry plant. Of course, strawberry nutrition facts are important to all of us. Strawberries are certainly some of the healthiest, most nourishing foods that a person can possibly eat. However, as much joy as the strawberry brings to the lives of so many of us, there are a few people who cannot enjoy the little gems due to having a strawberry allergy (or other difficulties). And then there is the so-called "strawberry" hemangioma. 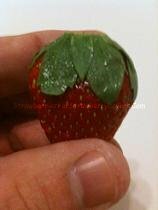 This is a skin disorder which appears in infancy, and really has nothing to do with strawberries at all; it only looks a bit like seedless, red, strawberry flesh. Every fan of strawberries should know about this disorder... and that it is NOT caused by strawberries. which is hosted by Children's Hospital Boston (please note that some of the images on this site may not be suitable for all individuals, so the exercise of the visitor's discretion is advised). This webpage has (among other things) several short but informative videos. Once you've "digested" these interesting facts about strawberries, you're appreciation of each new strawberry experience will reach to an even greater height than ever before. So discover the "behind the scenes" world of strawberries, and savor their flavor even more! Home of the World's Happiest (and most interesting) Fruit!